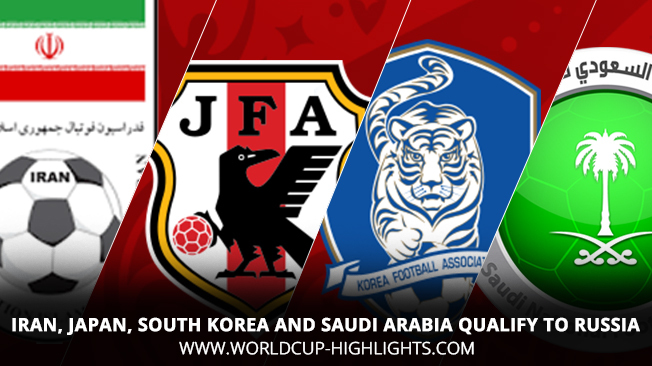 Iran, Japan, South Korea and Saudi Arabia Qualify to Russia. South Korea following Japan's move to Russia's 2018 World Cup finals after a goalless draw against Uzbekistan on Tuesday (6/9). This draw is enough to make South Korea end the third round of Asian zone qualifying in Group Two with a collection of 15 points. The certainty of South Korea's escape is also helped by the results achieved by rivals, Syria. Needing a victory, Syria is only able to play a 2-2 draw against Iran who had already made sure to qualify. South Korea's breakthrough is the ninth consecutive time and became the first Asian country to appear in the World Cup finals 10 times. And Saudi Arabia became the fourth team from the Asian zone that qualified for the 2018 World Cup. The Saudis followed Iran, Japan and South Korea. The Saudis ensure their breakthrough after a 1-0 win at home to Japan in the last Matchday Group B Asian qualifying round three, Wednesday (06/9). The victory ensured the Saudis finished second place behind Japan and above Australia. The Saudis are also entitled to appear in the main round in Russia next year. The sole goal of a Saudi victory over Japan was scored by substitute Fahad Al-Muwallad on 63 minutes. In Group A, the top three are occupied by Iran, South Korea and Syria. The top three of Group B are Japan, Saudi Arabia and Australia. Rank one and two of each group qualify automatically to Russia 2018. Meanwhile, ranked third (Syria and Australia) advanced to the Asian zone play-off round. Syria and Australia will fight in a two-leg party on 5 and 10 October. The winner will advance to an intercontinental play-off against a fourth-ranked team from the CONCACAF zone qualifiers. So far, there are eight teams confirmed to compete in the 2018 World Cup. They are the hosts of Russia (automatic escape), Brazil, Iran, Japan, Mexico, Belgium, South Korea and Saudi Arabia.